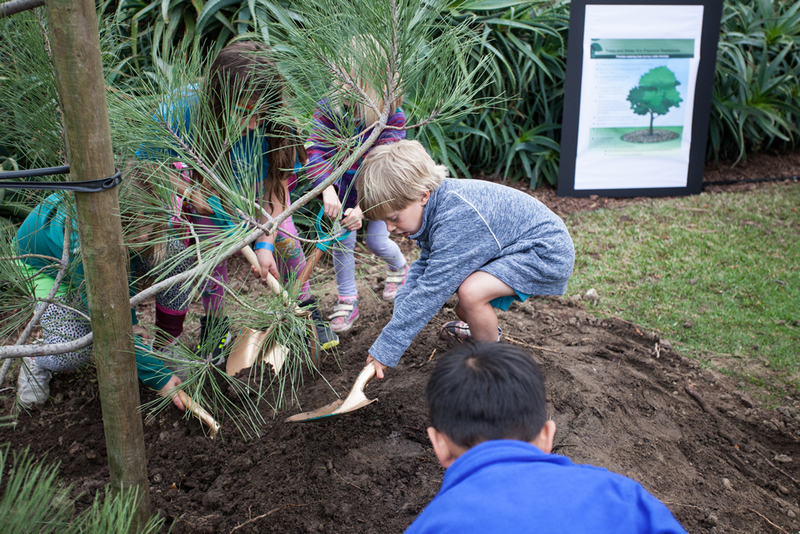 Sponsored by the city and the newly created Laguna Beach Urban Tree Fund, the event featured activities for kids, composting advice, meet and greet opportunities with local community groups, plant giveaways, live music and snacks. Boys and Girls Club members joined Council members Iseman and Zur Schmiede planting a tree in Laguna’s first Arbor Day celebration. Photos by Donee Quincena. The new tree, planted by 10 kids from the Boys and Girls Club using gold shovels, replaces a specimen lost in a recent storm. It was donated by West Coast Arborists, whose staff maintains city trees under contract to the city of Laguna Beach. City Council member Robert Zur Schmiede extolled the benefits trees provide, virtues echoed later in presentations by Hallie Jones, of Laguna Canyon Foundation, Ruben Flores, of Laguna Nursery, and Billy Fried, an Indy columnist. Also present were councilmembers Bob Whalen and Toni Iseman, who said her Nebraska City grandfather knew the founder of Arbor Day, J. Sterling Morton. With Whalen’s proclamation at the Feb. 27 council meeting, making March 7 Arbor Day in Laguna Beach, the city now has taken the final step toward becoming recognized by the Arbor Day Foundation as an official Tree City USA , a coveted designation and a source of city pride. Other qualifications include having a city tree department, a tree care ordinance and an urban tree fund. 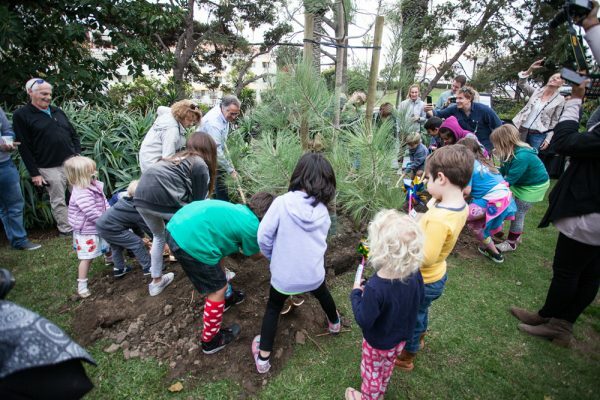 The Laguna Beach Urban Tree Fund was recently established with a $50,000 endowment by local residents Barbara and Greg MacGillivray, who were not present. The funds will be used to supplement city expenditures on replacement trees through a grant process, enabling the replanting of larger trees lost in the downtown area, said Natalie Redwitz, a spokesperson for the MacGillivrays. Obtaining a grant from the Laguna Beach Urban Tree Fund requires submitting a request for funds needed to purchase a larger specimen. The fund will underwrite the difference, Redwitz said.“Primary consultation would be done with Ruben Flores,” she added. “For a start, we hope to replant the 40 or more trees that have been removed and had their wells filled in with cement,” Redwitz said. The city will maintain the new trees, although the fund may provide for additional watering and pruning, as necessary. Flores said at least 17 new magnolia and ficus trees are planned for Ocean Avenue and he will be offering professional advice as needed. He also advocated for replanting new eucalyptus trees in the Lumberyard Mall on Forest Avenue. Ann Christoph, a landscape architect and former council member, said she agreed with that plan. The need to protect Laguna’s trees gained new momentum when the two 80-foot tall eucalyptus trees were removed from the Lumberyard Mall in March of 2016. The owner of the mall obtained a permit from the city to remove the trees after a visual inspection by registered consulting arborist Lisa Smith detected signs of disease and decay. Nevertheless, protests over the lack of public notice prompted a revision of city policy that now requires a tree to be tagged with yellow ribbon if it is considered for removal. A rash of vandalism to trees on private property elicited a call for further restrictions. Such rules are to be considered by the City Council this summer, said Shoreh Dupuis, the city’s director of public works. Deep cuts marked five eucalyptus trees bordering the Montage resort were made in November of 2016. Although at the time Ms. MacGillivray offered a $5,000 reward for information leading to the arrest of those involved, no suspects have been identified, said Sgt. Jim Cota. Those wishing to contribute to the new tree fund may do so online at https.//donor.oc-cf.org/make-a-donation.